I always try to have some Bolognese in the freezer, divided into portions. It gives me a day off when I’m sick of cooking or have run out of shopping money. This recipe is for 20 adult size portions. Served with rice or with pasta. Chop 3 large onions and fry gently in a little vegetable oil until soft. Add three stock cubes; beef, chicken or vegetable, stir. Put the 3 packs (3 x 750g) of mince in the pan and turn up heat to brown. Fry for about 10 mins, until all the liquid has evaporated. breaking up the meat with a wooden spoon or spatula. Put 8 tins of chopped tomatoes in a large pan and bring to the boil. Add mince and onions to the tomatoes. At this point I like to add spices but these are entirely optional. My favourites are fennel seed, paprika, celery salt and garlic powder. Next, grate a bag (about 10) of carrots and either 4 sticks of celery or a courgette. Fry until soft then add to the tomatoes/mince. Simmer for at least 40 minutes and up to an hour and a half until everything is soft. Add salt if needed. Wash and dry the plastic containers that the meat came in. 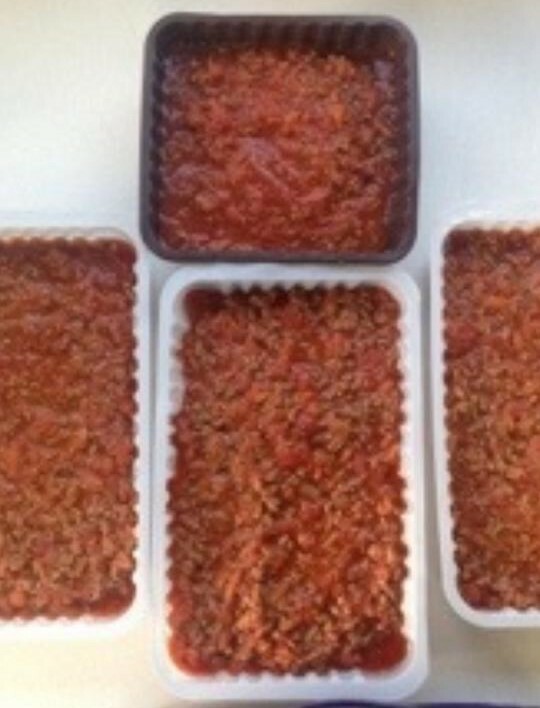 When the Bolognese is cooled, ladle into the 3 containers before wrapping in cling film to freeze. Each one will hold enough for 5 big portions and leave you with enough in the pan to provide your first meal for 5. Remove from freezer to defrost before reheating to piping hot. Serve with pasta; mix with tinned kidney beans and chilli powder to make chilli con carne; fill wraps, fold and fry to make quesadillas.